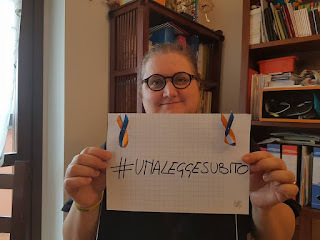 Ho assistito da casa (in decorso post operatorio per un intervento programmato da tempo e grazie al cielo andato bene) al triste e patetico dibattito parlamentare di oggi sulla questione vaccini, apparsa improvvisamente sulla scena politica e senza profonde motivazioni d’urgenza, se non di sensibilizzazione e cultura sociale. Mentre la fine della legislatura si avvicina il governo si dimentica dei #caregiver e si prepara ad una bella spesa per i vaccini che aumenteranno la spesa pubblica. Io non sono contro i vaccini e nemmeno contro lo ius soli, ma penso che le priorità di fine legislatura siano altre. Sono decine di anni che i #caregiverfamigliari aspettano una legge e i loro diritti vengono calpestati dalla presunzione di un costo sociale che in realtà non esiste. I just want to mention I am just newbie to blogs and really savored this web blog. Most likely I’m going to bookmark your blog post . You really come with very good articles. Regards for sharing with us your web page. Hiya, I am really glad I have found this information. Today bloggers publish just about gossip and web stuff and this is actually irritating. A good blog with exciting content, that is what I need. Thanks for making this site, and I’ll be visiting again. Do you do newsletters by email? Hiya, I’m really glad I have found this info. Today bloggers publish only about gossip and internet stuff and this is really irritating. A good site with exciting content, this is what I need. Thanks for making this site, and I’ll be visiting again. Do you do newsletters by email? Hello there. I found your site by way of Google even as searching for a similar subject, your web site got here up. It looks good. I’ve bookmarked it in my google bookmarks to visit then. Hiya, I’m really glad I’ve found this information. Nowadays bloggers publish just about gossip and internet stuff and this is really frustrating. A good blog with exciting content, that’s what I need. Thanks for making this web-site, and I’ll be visiting again. Do you do newsletters by email? Hi there. I discovered your blog by means of Google at the same time as looking for a similar topic, your website got here up. It looks great. I have bookmarked it in my google bookmarks to come back then. Hey there. I found your website by means of Google while looking for a related topic, your web site came up. It seems great. I’ve bookmarked it in my google bookmarks to visit then. Hiya, I’m really glad I’ve found this information. Today bloggers publish just about gossip and internet stuff and this is actually irritating. A good website with interesting content, that’s what I need. Thank you for making this web-site, and I will be visiting again. Do you do newsletters by email? Hello there. I found your web site by means of Google whilst searching for a comparable topic, your site came up. It seems to be good. I have bookmarked it in my google bookmarks to come back then. Hey there. I found your website by means of Google even as looking for a related subject, your web site got here up. It appears great. I have bookmarked it in my google bookmarks to come back then. Hiya, I am really glad I’ve found this info. Nowadays bloggers publish just about gossip and internet stuff and this is really frustrating. A good web site with exciting content, this is what I need. Thank you for making this website, and I will be visiting again. Do you do newsletters by email? Hello there. I found your blog by the use of Google at the same time as looking for a similar matter, your web site came up. It seems to be good. I have bookmarked it in my google bookmarks to visit then. Hiya, I am really glad I have found this info. Today bloggers publish just about gossip and net stuff and this is really annoying. A good blog with exciting content, this is what I need. Thank you for making this site, and I will be visiting again. Do you do newsletters by email? Hiya, I am really glad I’ve found this information. Nowadays bloggers publish only about gossip and web stuff and this is really irritating. A good site with interesting content, that is what I need. Thank you for making this website, and I’ll be visiting again. Do you do newsletters by email? Hey there. I discovered your web site via Google while searching for a comparable topic, your web site got here up. It seems good. I’ve bookmarked it in my google bookmarks to visit then. Hiya, I am really glad I’ve found this info. Nowadays bloggers publish just about gossip and web stuff and this is really annoying. A good blog with interesting content, that is what I need. Thanks for making this web-site, and I will be visiting again. Do you do newsletters by email? Hiya, I am really glad I have found this info. Nowadays bloggers publish just about gossip and net stuff and this is actually annoying. A good blog with exciting content, that’s what I need. Thanks for making this web-site, and I will be visiting again. Do you do newsletters by email? Hiya, I’m really glad I have found this information. Today bloggers publish just about gossip and internet stuff and this is really annoying. A good blog with interesting content, that is what I need. Thank you for making this web site, and I’ll be visiting again. Do you do newsletters by email? Hiya, I’m really glad I have found this information. Today bloggers publish only about gossip and internet stuff and this is really annoying. A good blog with exciting content, that’s what I need. Thank you for making this site, and I’ll be visiting again. Do you do newsletters by email? Hiya, I am really glad I’ve found this information. Today bloggers publish just about gossip and net stuff and this is actually irritating. A good site with exciting content, that’s what I need. Thanks for making this site, and I will be visiting again. Do you do newsletters by email? Hi there. I found your website via Google even as searching for a related subject, your site came up. It seems to be great. I’ve bookmarked it in my google bookmarks to come back then. Hey there. I found your blog via Google even as looking for a related matter, your web site came up. It appears to be good. I’ve bookmarked it in my google bookmarks to come back then. Hiya, I’m really glad I have found this info. Today bloggers publish just about gossip and net stuff and this is really irritating. A good web site with exciting content, that’s what I need. Thanks for making this web site, and I’ll be visiting again. Do you do newsletters by email? Hiya, I’m really glad I have found this info. Nowadays bloggers publish just about gossip and internet stuff and this is really frustrating. A good web site with exciting content, that’s what I need. Thank you for making this site, and I will be visiting again. Do you do newsletters by email? Hiya, I am really glad I’ve found this info. Today bloggers publish only about gossip and net stuff and this is really irritating. A good site with exciting content, that is what I need. Thank you for making this web site, and I’ll be visiting again. Do you do newsletters by email? Hey there. I discovered your website by the use of Google whilst searching for a related matter, your web site got here up. It appears to be great. I’ve bookmarked it in my google bookmarks to visit then. Hiya, I’m really glad I have found this info. Nowadays bloggers publish only about gossip and net stuff and this is really annoying. A good website with interesting content, this is what I need. Thank you for making this web site, and I’ll be visiting again. Do you do newsletters by email? Hi there. I discovered your web site by way of Google while searching for a similar topic, your website came up. It appears good. I have bookmarked it in my google bookmarks to visit then. Hiya, I am really glad I have found this info. Nowadays bloggers publish only about gossip and net stuff and this is really frustrating. A good site with exciting content, that’s what I need. Thanks for making this website, and I’ll be visiting again. Do you do newsletters by email? Hiya, I’m really glad I’ve found this info. Nowadays bloggers publish just about gossip and web stuff and this is really frustrating. A good web site with interesting content, this is what I need. Thanks for making this web site, and I will be visiting again. Do you do newsletters by email? Hi there. I found your site by way of Google even as searching for a related topic, your web site got here up. It appears good. I’ve bookmarked it in my google bookmarks to visit then. Hi there. I found your website by way of Google even as searching for a comparable subject, your web site got here up. It appears good. I have bookmarked it in my google bookmarks to visit then. Thanks for every other fantastic article. Where else could anybody get that type of info in such an ideal way of writing? I’ve a presentation subsequent week, and I am at the search for such information. Hiya, I am really glad I’ve found this information. Today bloggers publish just about gossip and net stuff and this is actually irritating. A good website with exciting content, this is what I need. Thank you for making this web-site, and I’ll be visiting again. Do you do newsletters by email? Hiya, I am really glad I’ve found this information. Today bloggers publish just about gossip and internet stuff and this is really irritating. A good blog with exciting content, that’s what I need. Thank you for making this site, and I will be visiting again. Do you do newsletters by email? Hello there. I discovered your site via Google even as searching for a comparable matter, your web site came up. It seems good. I’ve bookmarked it in my google bookmarks to visit then. Hi there. I found your blog via Google whilst looking for a related subject, your web site got here up. It seems great. I’ve bookmarked it in my google bookmarks to come back then. Hello there. I discovered your blog by way of Google whilst looking for a related matter, your site got here up. It appears to be good. I have bookmarked it in my google bookmarks to visit then. Hello there. I discovered your website via Google while looking for a similar matter, your web site came up. It appears great. I have bookmarked it in my google bookmarks to come back then. Hi there. I discovered your web site by means of Google at the same time as looking for a related matter, your web site got here up. It seems great. I’ve bookmarked it in my google bookmarks to come back then. Hiya, I am really glad I’ve found this info. Today bloggers publish only about gossip and internet stuff and this is actually annoying. A good website with interesting content, this is what I need. Thanks for making this web site, and I will be visiting again. Do you do newsletters by email? Hiya, I am really glad I have found this information. Nowadays bloggers publish only about gossip and web stuff and this is actually frustrating. A good blog with exciting content, this is what I need. Thanks for making this web site, and I’ll be visiting again. Do you do newsletters by email? Hiya, I am really glad I’ve found this info. Nowadays bloggers publish just about gossip and internet stuff and this is really annoying. A good web site with exciting content, this is what I need. Thank you for making this web-site, and I will be visiting again. Do you do newsletters by email? Hey there. I found your blog by the use of Google whilst searching for a related topic, your web site got here up. It seems to be good. I have bookmarked it in my google bookmarks to visit then. Hiya, I am really glad I’ve found this information. Nowadays bloggers publish only about gossip and internet stuff and this is actually irritating. A good site with exciting content, that’s what I need. Thanks for making this site, and I’ll be visiting again. Do you do newsletters by email? Hiya, I’m really glad I’ve found this information. Today bloggers publish just about gossip and internet stuff and this is really frustrating. A good site with exciting content, that is what I need. Thank you for making this website, and I will be visiting again. Do you do newsletters by email? Hiya, I am really glad I have found this information. Today bloggers publish only about gossip and internet stuff and this is actually irritating. A good web site with exciting content, that’s what I need. Thank you for making this website, and I’ll be visiting again. Do you do newsletters by email? Hey there. I discovered your web site by means of Google at the same time as searching for a comparable topic, your web site came up. It appears to be great. I’ve bookmarked it in my google bookmarks to visit then. Hiya, I am really glad I’ve found this information. Nowadays bloggers publish only about gossip and net stuff and this is actually frustrating. A good web site with interesting content, that’s what I need. Thanks for making this web-site, and I’ll be visiting again. Do you do newsletters by email? Hiya, I’m really glad I’ve found this information. Nowadays bloggers publish just about gossip and net stuff and this is really irritating. A good web site with interesting content, this is what I need. Thank you for making this website, and I’ll be visiting again. Do you do newsletters by email? Hiya, I am really glad I have found this info. Nowadays bloggers publish just about gossip and internet stuff and this is really annoying. A good website with interesting content, that is what I need. Thank you for making this website, and I will be visiting again. Do you do newsletters by email? Hiya, I’m really glad I’ve found this information. Nowadays bloggers publish just about gossip and net stuff and this is actually frustrating. A good web site with exciting content, this is what I need. Thanks for making this web-site, and I will be visiting again. Do you do newsletters by email? Hiya, I am really glad I’ve found this information. Nowadays bloggers publish just about gossip and net stuff and this is actually irritating. A good blog with interesting content, that is what I need. Thank you for making this site, and I’ll be visiting again. Do you do newsletters by email? Hiya, I am really glad I have found this information. Today bloggers publish just about gossip and web stuff and this is really irritating. A good website with exciting content, this is what I need. Thank you for making this site, and I’ll be visiting again. Do you do newsletters by email? Hiya, I am really glad I’ve found this information. Today bloggers publish just about gossip and internet stuff and this is really irritating. A good site with exciting content, this is what I need. Thank you for making this web-site, and I’ll be visiting again. Do you do newsletters by email? Hi there. I discovered your blog by the use of Google even as looking for a comparable topic, your site came up. It seems to be good. I’ve bookmarked it in my google bookmarks to come back then. Hey there. I discovered your site by the use of Google while looking for a similar topic, your website got here up. It appears good. I have bookmarked it in my google bookmarks to visit then. Hi there. I discovered your blog by means of Google while searching for a similar subject, your website came up. It seems to be great. I’ve bookmarked it in my google bookmarks to come back then. Hi there. I discovered your site via Google even as looking for a related matter, your website got here up. It looks great. I’ve bookmarked it in my google bookmarks to come back then. Hiya, I’m really glad I’ve found this information. Today bloggers publish only about gossip and internet stuff and this is really annoying. A good web site with interesting content, that’s what I need. Thanks for making this website, and I’ll be visiting again. Do you do newsletters by email? Hi there. I found your web site by the use of Google while searching for a related subject, your site came up. It looks great. I have bookmarked it in my google bookmarks to visit then. Hiya, I’m really glad I’ve found this information. Nowadays bloggers publish only about gossip and net stuff and this is really irritating. A good site with exciting content, that’s what I need. Thanks for making this web-site, and I’ll be visiting again. Do you do newsletters by email? Hi there. I discovered your web site by way of Google even as searching for a comparable subject, your website got here up. It appears good. I have bookmarked it in my google bookmarks to visit then. Hiya, I am really glad I have found this info. Nowadays bloggers publish just about gossip and internet stuff and this is actually frustrating. A good web site with interesting content, this is what I need. Thanks for making this website, and I will be visiting again. Do you do newsletters by email? Hiya, I’m really glad I have found this information. Nowadays bloggers publish just about gossip and web stuff and this is actually irritating. A good blog with interesting content, that’s what I need. Thanks for making this site, and I will be visiting again. Do you do newsletters by email? Hi there. I found your blog by way of Google even as looking for a similar subject, your site came up. It seems great. I have bookmarked it in my google bookmarks to visit then. Hi there. I found your website by the use of Google at the same time as looking for a comparable subject, your website came up. It appears great. I’ve bookmarked it in my google bookmarks to come back then. Hiya, I’m really glad I’ve found this info. Nowadays bloggers publish only about gossips and internet and this is actually irritating. A good blog with interesting content, that’s what I need. Thank you for keeping this website, I will be visiting it. Do you do newsletters? Can not find it. Hey there. I discovered your web site via Google at the same time as searching for a comparable matter, your web site came up. It appears to be good. I have bookmarked it in my google bookmarks to visit then. Hello there. I found your website by means of Google whilst searching for a comparable subject, your web site came up. It looks great. I’ve bookmarked it in my google bookmarks to come back then. Hey there. I found your blog via Google even as looking for a similar topic, your website got here up. It appears to be good. I’ve bookmarked it in my google bookmarks to come back then. Hi there. I found your web site by the use of Google at the same time as searching for a comparable subject, your website got here up. It seems great. I have bookmarked it in my google bookmarks to visit then. Hey there. I found your web site via Google whilst searching for a related topic, your site came up. It seems good. I have bookmarked it in my google bookmarks to come back then. Hiya, I’m really glad I have found this information. Nowadays bloggers publish just about gossip and web stuff and this is actually annoying. A good blog with exciting content, that is what I need. Thanks for making this website, and I will be visiting again. Do you do newsletters by email? Hey there. I found your website by the use of Google at the same time as looking for a similar topic, your site got here up. It looks good. I’ve bookmarked it in my google bookmarks to come back then. Whats Going down i’m new to this, I stumbled upon this I’ve discovered It positively useful and it has helped me out loads. I’m hoping to contribute & assist other users like its aided me. Great job. Hey there. I discovered your site by way of Google while searching for a comparable subject, your web site got here up. It seems good. I’ve bookmarked it in my google bookmarks to come back then. Hello there. I discovered your site by means of Google even as searching for a comparable matter, your web site came up. It appears to be great. I’ve bookmarked it in my google bookmarks to visit then. Hiya, I am really glad I’ve found this info. Nowadays bloggers publish only about gossip and web stuff and this is actually irritating. A good site with exciting content, this is what I need. Thanks for making this web site, and I will be visiting again. Do you do newsletters by email? Hi there. I found your site by means of Google whilst searching for a related topic, your site came up. It seems great. I have bookmarked it in my google bookmarks to come back then. Hiya, I am really glad I’ve found this information. Today bloggers publish just about gossip and web stuff and this is actually irritating. A good site with interesting content, this is what I need. Thank you for making this site, and I’ll be visiting again. Do you do newsletters by email? Hey there. I found your web site via Google even as searching for a similar topic, your website came up. It seems to be great. I’ve bookmarked it in my google bookmarks to visit then. Hi there. I discovered your web site by way of Google at the same time as looking for a similar topic, your web site got here up. It appears to be great. I have bookmarked it in my google bookmarks to visit then. Hiya, I’m really glad I’ve found this information. Today bloggers publish only about gossip and internet stuff and this is actually irritating. A good website with exciting content, this is what I need. Thanks for making this site, and I’ll be visiting again. Do you do newsletters by email? Hey there. I found your website by the use of Google even as looking for a comparable matter, your website got here up. It appears to be good. I’ve bookmarked it in my google bookmarks to visit then. Hi there. I found your blog via Google even as looking for a comparable topic, your web site got here up. It seems to be great. I’ve bookmarked it in my google bookmarks to visit then. Hi there. I found your site by way of Google while looking for a comparable topic, your site got here up. It seems good. I’ve bookmarked it in my google bookmarks to visit then. Hi there. I found your blog via Google whilst looking for a comparable matter, your web site came up. It appears great. I’ve bookmarked it in my google bookmarks to visit then. Hello there. I discovered your blog via Google even as looking for a comparable topic, your site got here up. It looks great. I’ve bookmarked it in my google bookmarks to come back then. Hey there. I found your site by the use of Google while searching for a comparable topic, your web site got here up. It seems good. I have bookmarked it in my google bookmarks to come back then. Hiya, I’m really glad I’ve found this information. Today bloggers publish only about gossip and internet stuff and this is actually irritating. A good web site with exciting content, this is what I need. Thank you for making this web-site, and I will be visiting again. Do you do newsletters by email? Hiya, I am really glad I have found this info. Today bloggers publish only about gossip and internet stuff and this is actually irritating. A good web site with interesting content, this is what I need. Thanks for making this site, and I will be visiting again. Do you do newsletters by email? Hiya, I’m really glad I have found this info. Today bloggers publish just about gossip and net stuff and this is actually frustrating. A good web site with exciting content, this is what I need. Thank you for making this web site, and I will be visiting again. Do you do newsletters by email? Hello there. I discovered your blog by the use of Google even as searching for a similar subject, your site got here up. It appears to be great. I have bookmarked it in my google bookmarks to visit then. Hi there. I found your blog by the use of Google at the same time as looking for a similar topic, your site got here up. It appears good. I’ve bookmarked it in my google bookmarks to visit then. Hello there. I found your blog via Google at the same time as looking for a related topic, your website came up. It seems to be great. I’ve bookmarked it in my google bookmarks to visit then. Hello there. I discovered your web site by means of Google whilst looking for a comparable topic, your website got here up. It seems to be good. I have bookmarked it in my google bookmarks to visit then. Hiya, I am really glad I have found this information. Today bloggers publish only about gossip and web stuff and this is really irritating. A good website with exciting content, this is what I need. Thanks for making this web-site, and I will be visiting again. Do you do newsletters by email? Hiya, I’m really glad I have found this information. Today bloggers publish just about gossip and internet stuff and this is really irritating. A good web site with interesting content, that is what I need. Thanks for making this site, and I’ll be visiting again. Do you do newsletters by email? Hiya, I’m really glad I’ve found this info. Nowadays bloggers publish just about gossip and net stuff and this is actually annoying. A good blog with interesting content, this is what I need. Thanks for making this site, and I will be visiting again. Do you do newsletters by email? Hi there, I discovered your website by the use of Google whilst looking for a similar matter, your web site got here up, it seems to be good. I’ve bookmarked it in my google bookmarks. Hiya, I am really glad I have found this info. Nowadays bloggers publish only about gossip and web stuff and this is actually irritating. A good web site with interesting content, this is what I need. Thank you for making this web-site, and I will be visiting again. Do you do newsletters by email? Hello there. I found your website by the use of Google whilst looking for a comparable topic, your web site came up. It appears great. I’ve bookmarked it in my google bookmarks to visit then. Hi there. I found your blog by means of Google while looking for a related topic, your site got here up. It appears great. I’ve bookmarked it in my google bookmarks to visit then. Hiya, I am really glad I have found this information. Nowadays bloggers publish only about gossip and internet stuff and this is really annoying. A good site with exciting content, this is what I need. Thanks for making this web site, and I’ll be visiting again. Do you do newsletters by email? Hiya, I’m really glad I have found this info. Today bloggers publish just about gossip and internet stuff and this is actually frustrating. A good blog with exciting content, that’s what I need. Thank you for making this web-site, and I will be visiting again. Do you do newsletters by email? Hiya, I’m really glad I’ve found this information. Today bloggers publish only about gossip and net stuff and this is really irritating. A good web site with interesting content, that’s what I need. Thank you for making this website, and I will be visiting again. Do you do newsletters by email? Hiya, I’m really glad I’ve found this info. Nowadays bloggers publish only about gossip and web stuff and this is really irritating. A good website with exciting content, this is what I need. Thanks for making this web-site, and I will be visiting again. Do you do newsletters by email? Hey there. I found your website by means of Google while searching for a comparable subject, your web site got here up. It seems good. I have bookmarked it in my google bookmarks to come back then. Hiya, I am really glad I have found this information. Nowadays bloggers publish just about gossip and net stuff and this is really frustrating. A good blog with exciting content, this is what I need. Thanks for making this web site, and I’ll be visiting again. Do you do newsletters by email? Hiya, I am really glad I’ve found this information. Today bloggers publish only about gossip and web stuff and this is really irritating. A good site with interesting content, this is what I need. Thanks for making this web-site, and I’ll be visiting again. Do you do newsletters by email? Hiya, I’m really glad I have found this information. Today bloggers publish just about gossip and internet stuff and this is really frustrating. A good blog with exciting content, that’s what I need. Thanks for making this web site, and I will be visiting again. Do you do newsletters by email? Hiya, I’m really glad I have found this information. Nowadays bloggers publish only about gossip and web stuff and this is really annoying. A good web site with exciting content, this is what I need. Thank you for making this web site, and I’ll be visiting again. Do you do newsletters by email? Hi there. I found your site by the use of Google at the same time as looking for a related subject, your website got here up. It appears to be good. I have bookmarked it in my google bookmarks to visit then. Hello there. I found your blog by way of Google at the same time as searching for a comparable matter, your website got here up. It seems to be great. I have bookmarked it in my google bookmarks to visit then. Hiya, I’m really glad I’ve found this information. Today bloggers publish only about gossip and web stuff and this is actually irritating. A good site with interesting content, this is what I need. Thanks for making this web-site, and I’ll be visiting again. Do you do newsletters by email? Hello there. I found your site via Google even as looking for a comparable matter, your site got here up. It appears to be great. I have bookmarked it in my google bookmarks to visit then. Hey there. I found your website by means of Google at the same time as looking for a comparable subject, your website came up. It looks good. I have bookmarked it in my google bookmarks to come back then. Hello there. I discovered your web site by means of Google whilst searching for a related matter, your website got here up. It seems great. I have bookmarked it in my google bookmarks to visit then. Hi there. I found your blog via Google while looking for a similar subject, your web site came up. It seems good. I’ve bookmarked it in my google bookmarks to come back then. Hiya, I’m really glad I have found this info. Today bloggers publish only about gossip and web stuff and this is really frustrating. A good web site with exciting content, this is what I need. Thank you for making this website, and I will be visiting again. Do you do newsletters by email? Hiya, I’m really glad I’ve found this information. Today bloggers publish only about gossip and web stuff and this is actually irritating. A good website with exciting content, this is what I need. Thank you for making this web-site, and I’ll be visiting again. Do you do newsletters by email? Hi there. I discovered your site via Google while searching for a comparable topic, your site came up. It appears to be good. I’ve bookmarked it in my google bookmarks to visit then. Hiya, I’m really glad I’ve found this info. Nowadays bloggers publish only about gossip and internet stuff and this is actually frustrating. A good website with exciting content, this is what I need. Thank you for making this site, and I’ll be visiting again. Do you do newsletters by email? Hello there. I discovered your site by way of Google even as looking for a comparable matter, your website got here up. It appears to be great. I have bookmarked it in my google bookmarks to visit then. Hey there. I found your website via Google at the same time as searching for a comparable subject, your website got here up. It appears to be good. I’ve bookmarked it in my google bookmarks to visit then. Hi there. I found your site via Google while looking for a similar subject, your web site got here up. It seems to be great. I’ve bookmarked it in my google bookmarks to come back then. Hiya, I am really glad I’ve found this information. Today bloggers publish only about gossip and web stuff and this is actually annoying. A good site with interesting content, that’s what I need. Thanks for making this web site, and I’ll be visiting again. Do you do newsletters by email? Hiya, I’m really glad I have found this info. Nowadays bloggers publish just about gossip and web stuff and this is actually frustrating. A good site with interesting content, this is what I need. Thanks for making this website, and I’ll be visiting again. Do you do newsletters by email? Hiya, I am really glad I’ve found this info. Today bloggers publish only about gossip and internet stuff and this is actually annoying. A good website with interesting content, that is what I need. Thanks for making this site, and I will be visiting again. Do you do newsletters by email? Hello there. I found your website via Google whilst searching for a similar topic, your website came up. It looks good. I’ve bookmarked it in my google bookmarks to visit then. Hiya, I am really glad I’ve found this info. Nowadays bloggers publish only about gossip and internet stuff and this is really frustrating. A good web site with interesting content, this is what I need. Thanks for making this web-site, and I will be visiting again. Do you do newsletters by email? Hiya, I’m really glad I’ve found this info. Today bloggers publish just about gossip and internet stuff and this is actually annoying. A good website with exciting content, that’s what I need. Thank you for making this web site, and I will be visiting again. Do you do newsletters by email? Hello there. I discovered your blog by the use of Google whilst looking for a comparable matter, your site got here up. It looks good. I’ve bookmarked it in my google bookmarks to come back then. Hello there. I found your site by way of Google whilst looking for a comparable topic, your web site got here up. It seems great. I have bookmarked it in my google bookmarks to visit then. Hi there. I discovered your blog by way of Google even as searching for a similar topic, your website came up. It appears good. I’ve bookmarked it in my google bookmarks to come back then. Hi there. I discovered your website by means of Google even as searching for a comparable topic, your site came up. It seems to be great. I have bookmarked it in my google bookmarks to come back then. Hello there. I discovered your blog by the use of Google even as searching for a similar matter, your site came up. It appears to be great. I have bookmarked it in my google bookmarks to visit then. Hi there. I discovered your website by the use of Google at the same time as searching for a comparable matter, your site came up. It seems to be great. I have bookmarked it in my google bookmarks to come back then. Hello there. I found your site by means of Google even as looking for a similar topic, your web site got here up. It seems to be great. I have bookmarked it in my google bookmarks to come back then. Hey there. I found your website by means of Google even as searching for a related subject, your site got here up. It looks good. I have bookmarked it in my google bookmarks to come back then. Hiya, I am really glad I have found this info. Today bloggers publish just about gossip and web stuff and this is actually annoying. A good web site with interesting content, that is what I need. Thanks for making this site, and I’ll be visiting again. Do you do newsletters by email? Hiya, I’m really glad I have found this information. Today bloggers publish only about gossip and web stuff and this is actually irritating. A good site with interesting content, this is what I need. Thank you for making this site, and I’ll be visiting again. Do you do newsletters by email? Hey there. I found your blog via Google whilst searching for a related subject, your site got here up. It seems great. I have bookmarked it in my google bookmarks to come back then. Hey there. I found your blog by means of Google at the same time as searching for a similar matter, your web site came up. It seems good. I’ve bookmarked it in my google bookmarks to come back then. Good ¡V I should definitely pronounce, impressed with your website. I had no trouble navigating through all tabs and related information ended up being truly easy to do to access. I recently found what I hoped for before you know it in the least. Quite unusual. Is likely to appreciate it for those who add forums or something, website theme . a tones way for your customer to communicate. Excellent task..
Hiya, I am really glad I’ve found this information. Nowadays bloggers publish just about gossip and web stuff and this is really irritating. A good site with interesting content, this is what I need. Thank you for making this web-site, and I’ll be visiting again. Do you do newsletters by email? Hiya, I am really glad I have found this information. Today bloggers publish just about gossip and net stuff and this is actually annoying. A good website with interesting content, this is what I need. Thanks for making this web site, and I will be visiting again. Do you do newsletters by email? Hello there. I found your site via Google whilst looking for a similar topic, your web site got here up. It seems to be great. I have bookmarked it in my google bookmarks to come back then. Hiya, I am really glad I have found this information. Today bloggers publish just about gossip and net stuff and this is really frustrating. A good site with interesting content, that’s what I need. Thanks for making this site, and I’ll be visiting again. Do you do newsletters by email? Hiya, I’m really glad I have found this info. Nowadays bloggers publish just about gossip and web stuff and this is actually annoying. A good site with exciting content, that is what I need. Thanks for making this web-site, and I will be visiting again. Do you do newsletters by email? Hello there. I discovered your website by the use of Google whilst searching for a comparable subject, your website got here up. It looks good. I have bookmarked it in my google bookmarks to visit then. Hey there. I found your site by way of Google at the same time as looking for a related matter, your web site got here up. It seems to be great. I’ve bookmarked it in my google bookmarks to come back then. Hiya, I am really glad I have found this information. Today bloggers publish just about gossip and internet stuff and this is really frustrating. A good blog with exciting content, that’s what I need. Thank you for making this website, and I’ll be visiting again. Do you do newsletters by email? Hello there. I found your website by the use of Google whilst searching for a comparable matter, your website got here up. It looks great. I’ve bookmarked it in my google bookmarks to visit then. Hiya, I’m really glad I have found this information. Today bloggers publish just about gossip and net stuff and this is actually frustrating. A good site with interesting content, this is what I need. Thanks for making this site, and I’ll be visiting again. Do you do newsletters by email? Hiya, I am really glad I’ve found this information. Nowadays bloggers publish only about gossip and web stuff and this is actually frustrating. A good website with exciting content, that is what I need. Thanks for making this website, and I’ll be visiting again. Do you do newsletters by email? Hiya, I’m really glad I’ve found this information. Nowadays bloggers publish only about gossip and internet stuff and this is actually frustrating. A good site with interesting content, this is what I need. Thank you for making this website, and I’ll be visiting again. Do you do newsletters by email? Hey there. I found your website by the use of Google even as looking for a related topic, your web site came up. It appears to be good. I have bookmarked it in my google bookmarks to come back then. Hi there. I discovered your web site by means of Google at the same time as looking for a comparable matter, your site came up. It appears to be good. I’ve bookmarked it in my google bookmarks to come back then. Hiya, I’m really glad I’ve found this information. Today bloggers publish just about gossip and internet stuff and this is actually irritating. A good blog with exciting content, this is what I need. Thank you for making this web site, and I’ll be visiting again. Do you do newsletters by email? Hiya, I’m really glad I have found this information. Nowadays bloggers publish only about gossip and internet stuff and this is really frustrating. A good web site with interesting content, this is what I need. Thank you for making this website, and I’ll be visiting again. Do you do newsletters by email? Hiya, I am really glad I have found this info. Today bloggers publish only about gossip and internet stuff and this is really frustrating. A good web site with exciting content, that’s what I need. Thank you for making this web site, and I will be visiting again. Do you do newsletters by email? Hiya, I’m really glad I have found this info. Nowadays bloggers publish just about gossip and web stuff and this is really irritating. A good blog with interesting content, that’s what I need. Thanks for making this web site, and I will be visiting again. Do you do newsletters by email? Hi there. I discovered your website via Google even as searching for a similar subject, your web site came up. It seems to be good. I’ve bookmarked it in my google bookmarks to come back then. Hello there. I discovered your blog via Google even as looking for a comparable matter, your web site came up. It appears great. I have bookmarked it in my google bookmarks to visit then. Hiya, I’m really glad I’ve found this information. Today bloggers publish only about gossip and internet stuff and this is really annoying. A good website with interesting content, that’s what I need. Thanks for making this web-site, and I will be visiting again. Do you do newsletters by email? Hi there. I found your site by way of Google even as searching for a related subject, your site got here up. It appears to be great. I’ve bookmarked it in my google bookmarks to come back then. Hiya, I am really glad I have found this information. Today bloggers publish just about gossip and web stuff and this is actually annoying. A good web site with exciting content, that’s what I need. Thanks for making this website, and I’ll be visiting again. Do you do newsletters by email? Hi there. I discovered your website via Google at the same time as looking for a similar topic, your website got here up. It seems to be great. I have bookmarked it in my google bookmarks to come back then. Hi there. I discovered your site by the use of Google at the same time as searching for a related subject, your web site got here up. It seems to be good. I’ve bookmarked it in my google bookmarks to come back then. Hiya, I’m really glad I’ve found this information. Today bloggers publish just about gossip and net stuff and this is really frustrating. A good website with exciting content, that is what I need. Thank you for making this web-site, and I’ll be visiting again. Do you do newsletters by email? Hey there. I discovered your website by the use of Google at the same time as searching for a related subject, your web site came up. It seems to be good. I’ve bookmarked it in my google bookmarks to visit then. Hi there. I found your blog by way of Google while looking for a similar topic, your website came up. It seems to be great. I’ve bookmarked it in my google bookmarks to come back then. Hey there. I found your blog by means of Google while looking for a similar topic, your website came up. It appears good. I’ve bookmarked it in my google bookmarks to visit then. Hiya, I’m really glad I have found this information. Today bloggers publish just about gossip and internet stuff and this is really frustrating. A good web site with interesting content, this is what I need. Thank you for making this web site, and I will be visiting again. Do you do newsletters by email? Hiya, I am really glad I’ve found this info. Nowadays bloggers publish only about gossip and net stuff and this is really frustrating. A good blog with interesting content, that’s what I need. Thank you for making this web-site, and I’ll be visiting again. Do you do newsletters by email? Hiya, I am really glad I have found this info. Today bloggers publish only about gossip and web stuff and this is really frustrating. A good blog with exciting content, this is what I need. Thanks for making this web site, and I’ll be visiting again. Do you do newsletters by email? Hiya, I’m really glad I have found this information. Today bloggers publish just about gossip and internet stuff and this is actually irritating. A good blog with exciting content, that’s what I need. Thank you for making this web-site, and I’ll be visiting again. Do you do newsletters by email? Hey there. I discovered your web site by the use of Google whilst searching for a related topic, your site got here up. It seems good. I have bookmarked it in my google bookmarks to visit then. magnificent issues altogether, you simply received a new reader. What might you recommend about your post that you made a few days ago? Any certain? Hey there. I found your site via Google even as looking for a related matter, your website got here up. It appears to be good. I’ve bookmarked it in my google bookmarks to come back then. Hiya, I am really glad I’ve found this info. Today bloggers publish only about gossip and net stuff and this is really frustrating. A good blog with exciting content, that is what I need. Thanks for making this web-site, and I will be visiting again. Do you do newsletters by email? Hiya, I am really glad I’ve found this info. Nowadays bloggers publish only about gossip and internet stuff and this is really frustrating. A good blog with exciting content, that is what I need. Thank you for making this web-site, and I’ll be visiting again. Do you do newsletters by email? Hiya, I’m really glad I’ve found this information. Today bloggers publish only about gossip and internet stuff and this is actually irritating. A good blog with exciting content, this is what I need. Thanks for making this site, and I will be visiting again. Do you do newsletters by email? Hello there. I found your site via Google at the same time as looking for a similar topic, your website got here up. It looks good. I have bookmarked it in my google bookmarks to come back then. Hiya, I’m really glad I’ve found this information. Today bloggers publish just about gossip and web stuff and this is actually annoying. A good web site with exciting content, this is what I need. Thanks for making this website, and I’ll be visiting again. Do you do newsletters by email? I’m still learning from you, but I’m trying to reach my goals. I definitely enjoy reading all that is written on your site.Keep the posts coming. I liked it! Hello there. I discovered your website by the use of Google even as looking for a comparable topic, your website got here up. It appears good. I’ve bookmarked it in my google bookmarks to visit then. Hello there. I discovered your web site via Google at the same time as looking for a related matter, your website got here up. It appears to be great. I’ve bookmarked it in my google bookmarks to visit then. naturally like your web-site however you need to check the spelling on quite a few of your posts. Several of them are rife with spelling issues and I to find it very troublesome to tell the truth on the other hand I will definitely come back again. Hey there. I discovered your website by means of Google whilst searching for a similar subject, your site got here up. It appears great. I’ve bookmarked it in my google bookmarks to visit then. Hello there. I found your web site via Google at the same time as looking for a comparable matter, your site came up. It looks great. I have bookmarked it in my google bookmarks to visit then. Hey there. I discovered your blog via Google at the same time as looking for a similar topic, your website got here up. It looks good. I’ve bookmarked it in my google bookmarks to come back then. Hey there. I discovered your website by the use of Google while searching for a comparable matter, your website got here up. It appears great. I’ve bookmarked it in my google bookmarks to visit then. Thanks for sharing excellent informations. Your web-site is very cool. I am impressed by the details that you¡¦ve on this website. It reveals how nicely you perceive this subject. Bookmarked this website page, will come back for extra articles. You, my friend, ROCK! I found just the info I already searched everywhere and simply couldn’t come across. What an ideal site. Hi there. I found your web site via Google whilst searching for a related subject, your web site got here up. It seems to be great. I have bookmarked it in my google bookmarks to visit then. Hey there. I discovered your web site by means of Google while looking for a similar topic, your web site came up. It seems good. I’ve bookmarked it in my google bookmarks to come back then. Hi there. I found your site via Google at the same time as searching for a comparable matter, your website came up. It seems good. I’ve bookmarked it in my google bookmarks to come back then. Hello there. I discovered your site by way of Google even as searching for a similar matter, your website came up. It seems great. I’ve bookmarked it in my google bookmarks to come back then. Hey there. I found your web site by way of Google while looking for a comparable subject, your site came up. It seems to be good. I have bookmarked it in my google bookmarks to come back then. Hi there. I discovered your site by the use of Google whilst searching for a comparable matter, your web site came up. It appears good. I’ve bookmarked it in my google bookmarks to visit then. Hiya, I am really glad I’ve found this information. Nowadays bloggers publish just about gossip and internet stuff and this is actually annoying. A good website with exciting content, that’s what I need. Thanks for making this web-site, and I will be visiting again. Do you do newsletters by email? Hiya, I am really glad I have found this information. Nowadays bloggers publish just about gossip and web stuff and this is really frustrating. A good website with exciting content, this is what I need. Thank you for making this site, and I’ll be visiting again. Do you do newsletters by email? Hello there. I discovered your web site via Google whilst searching for a similar subject, your site came up. It appears great. I’ve bookmarked it in my google bookmarks to come back then. Hello there. I found your website via Google at the same time as searching for a comparable subject, your web site got here up. It looks good. I have bookmarked it in my google bookmarks to visit then. Hiya, I’m really glad I’ve found this information. Today bloggers publish just about gossip and net stuff and this is actually frustrating. A good website with exciting content, this is what I need. Thanks for making this website, and I’ll be visiting again. Do you do newsletters by email? Hi there. I found your site via Google even as looking for a comparable topic, your site came up. It looks good. I have bookmarked it in my google bookmarks to visit then. Hiya, I am really glad I have found this information. Today bloggers publish just about gossip and web stuff and this is really annoying. A good blog with interesting content, that is what I need. Thank you for making this web-site, and I’ll be visiting again. Do you do newsletters by email? Hi there. I found your blog via Google even as looking for a similar subject, your web site got here up. It appears to be good. I’ve bookmarked it in my google bookmarks to come back then. Hiya, I’m really glad I have found this information. Today bloggers publish just about gossip and net stuff and this is actually frustrating. A good blog with exciting content, that is what I need. Thanks for making this web site, and I will be visiting again. Do you do newsletters by email? Hiya, I am really glad I have found this info. Nowadays bloggers publish only about gossip and internet stuff and this is really frustrating. A good web site with interesting content, that is what I need. Thank you for making this site, and I will be visiting again. Do you do newsletters by email? Hey there. I found your blog by the use of Google at the same time as looking for a similar topic, your website got here up. It appears to be good. I have bookmarked it in my google bookmarks to come back then. Hello there. I discovered your web site via Google even as looking for a comparable matter, your site got here up. It appears great. I have bookmarked it in my google bookmarks to come back then. Hiya, I’m really glad I’ve found this info. Nowadays bloggers publish just about gossip and net stuff and this is really frustrating. A good website with interesting content, this is what I need. Thanks for making this web site, and I’ll be visiting again. Do you do newsletters by email? Hiya, I am really glad I’ve found this information. Today bloggers publish only about gossip and internet stuff and this is really irritating. A good website with interesting content, that is what I need. Thank you for making this website, and I will be visiting again. Do you do newsletters by email? Hiya, I’m really glad I’ve found this info. Today bloggers publish just about gossip and internet stuff and this is really frustrating. A good blog with interesting content, that is what I need. Thanks for making this web-site, and I will be visiting again. Do you do newsletters by email? Hey there. I found your web site by the use of Google even as looking for a similar topic, your web site came up. It appears to be great. I have bookmarked it in my google bookmarks to come back then. Hiya, I’m really glad I have found this info. Nowadays bloggers publish just about gossip and net stuff and this is really frustrating. A good website with interesting content, this is what I need. Thank you for making this website, and I’ll be visiting again. Do you do newsletters by email? Hi there. I discovered your blog by the use of Google even as looking for a similar topic, your site got here up. It appears to be good. I’ve bookmarked it in my google bookmarks to visit then. Hi there. I found your web site by the use of Google whilst looking for a related subject, your site came up. It looks good. I have bookmarked it in my google bookmarks to visit then. Hi there. I discovered your site by way of Google even as searching for a comparable topic, your site got here up. It looks great. I have bookmarked it in my google bookmarks to visit then. Hi there. I found your web site by means of Google while looking for a comparable matter, your website got here up. It appears to be good. I’ve bookmarked it in my google bookmarks to visit then. Hi there. I discovered your site by means of Google at the same time as searching for a similar subject, your web site got here up. It appears good. I have bookmarked it in my google bookmarks to visit then. Hey there. I found your web site via Google even as looking for a similar subject, your site came up. It seems great. I’ve bookmarked it in my google bookmarks to come back then. Hello there. I found your website by means of Google while looking for a related topic, your website got here up. It looks great. I have bookmarked it in my google bookmarks to visit then. Hiya, I’m really glad I’ve found this info. Nowadays bloggers publish just about gossip and internet stuff and this is actually irritating. A good blog with interesting content, that’s what I need. Thank you for making this web site, and I will be visiting again. Do you do newsletters by email? Hey there. I discovered your blog by the use of Google while searching for a similar matter, your web site came up. It seems to be good. I have bookmarked it in my google bookmarks to come back then. Hey there. I found your web site by means of Google whilst searching for a similar matter, your website came up. It appears to be good. I’ve bookmarked it in my google bookmarks to visit then. Hey there. I discovered your site by means of Google whilst looking for a comparable subject, your website got here up. It appears to be good. I’ve bookmarked it in my google bookmarks to visit then. Hello there. I discovered your website via Google while searching for a similar subject, your web site came up. It looks great. I’ve bookmarked it in my google bookmarks to come back then. Hiya, I am really glad I’ve found this information. Today bloggers publish just about gossip and internet stuff and this is actually irritating. A good site with exciting content, that’s what I need. Thanks for making this web site, and I’ll be visiting again. Do you do newsletters by email? Hiya, I am really glad I’ve found this information. Nowadays bloggers publish just about gossip and net stuff and this is really annoying. A good website with interesting content, this is what I need. Thanks for making this website, and I will be visiting again. Do you do newsletters by email? Hey there. I found your web site by means of Google whilst searching for a comparable topic, your web site got here up. It looks great. I’ve bookmarked it in my google bookmarks to visit then. Hiya, I’m really glad I’ve found this info. Today bloggers publish only about gossip and net stuff and this is really irritating. A good web site with exciting content, this is what I need. Thanks for making this site, and I’ll be visiting again. Do you do newsletters by email? Hiya, I am really glad I have found this info. Today bloggers publish only about gossip and web stuff and this is really frustrating. A good blog with interesting content, this is what I need. Thanks for making this web-site, and I’ll be visiting again. Do you do newsletters by email? Hi there. I found your site by the use of Google even as looking for a related subject, your web site came up. It seems to be good. I’ve bookmarked it in my google bookmarks to visit then. Hiya, I’m really glad I have found this information. Today bloggers publish only about gossip and web stuff and this is really irritating. A good web site with exciting content, that is what I need. Thanks for making this web site, and I will be visiting again. Do you do newsletters by email? great points altogether, you simply received a brand new reader. What may you suggest about your post that you made a few days ago? Any sure? Hi there. I discovered your site via Google while searching for a related matter, your site got here up. It seems good. I’ve bookmarked it in my google bookmarks to come back then. Hello there. I found your website by way of Google at the same time as searching for a similar matter, your web site got here up. It seems great. I have bookmarked it in my google bookmarks to visit then. Hi there. I discovered your site by means of Google even as looking for a comparable matter, your web site came up. It looks great. I’ve bookmarked it in my google bookmarks to come back then. Hiya, I am really glad I’ve found this information. Today bloggers publish just about gossip and net stuff and this is really annoying. A good blog with interesting content, this is what I need. Thanks for making this web site, and I will be visiting again. Do you do newsletters by email? Hey there. I found your blog by way of Google at the same time as looking for a comparable subject, your web site came up. It looks good. I’ve bookmarked it in my google bookmarks to visit then. Hello my friend! I wish to say that this post is awesome, nice written and come with almost all significant infos. I¡¦d like to look extra posts like this . Useful information. Fortunate me I discovered your website unintentionally, and I’m surprised why this twist of fate didn’t happened in advance! I bookmarked it. Good ¡V I should definitely pronounce, impressed with your web site. I had no trouble navigating through all the tabs as well as related information ended up being truly simple to do to access. I recently found what I hoped for before you know it in the least. Reasonably unusual. Is likely to appreciate it for those who add forums or something, website theme . a tones way for your customer to communicate. Excellent task..
Hiya, I’m really glad I’ve found this info. Today bloggers publish just about gossip and internet stuff and this is actually frustrating. A good web site with exciting content, that’s what I need. Thanks for making this website, and I will be visiting again. Do you do newsletters by email? After study several of the blogs for your site now, and i genuinely appreciate your way of blogging. I bookmarked it to my bookmark internet site list and will also be checking back soon. Pls look at my web page as well and figure out what you believe. I carry on listening to the news talk about receiving boundless online grant applications so I have been looking around for the finest site to get one. Could you advise me please, where could i acquire some? Hi there. I found your blog by the use of Google at the same time as searching for a related subject, your site came up. It seems to be good. I have bookmarked it in my google bookmarks to visit then. Hiya, I’m really glad I’ve found this information. Today bloggers publish just about gossip and web stuff and this is actually irritating. A good web site with interesting content, this is what I need. Thanks for making this web-site, and I will be visiting again. Do you do newsletters by email? Hiya, I’m really glad I have found this info. Nowadays bloggers publish just about gossip and net stuff and this is really frustrating. A good website with exciting content, that’s what I need. Thanks for making this web-site, and I will be visiting again. Do you do newsletters by email? Hiya, I’m really glad I’ve found this information. Nowadays bloggers publish only about gossip and net stuff and this is really annoying. A good blog with interesting content, this is what I need. Thank you for making this web site, and I will be visiting again. Do you do newsletters by email? Hi there. I found your web site by means of Google even as looking for a comparable matter, your web site came up. It seems to be good. I have bookmarked it in my google bookmarks to visit then. Hiya, I am really glad I have found this information. Nowadays bloggers publish just about gossip and internet stuff and this is actually frustrating. A good web site with interesting content, that’s what I need. Thanks for making this web-site, and I will be visiting again. Do you do newsletters by email? Hello there. I discovered your blog by means of Google even as searching for a similar matter, your web site came up. It seems good. I have bookmarked it in my google bookmarks to visit then. Hello there. I found your site via Google whilst searching for a related subject, your site got here up. It appears to be good. I have bookmarked it in my google bookmarks to visit then. Hey there. I found your site by the use of Google at the same time as looking for a comparable subject, your website got here up. It appears to be good. I’ve bookmarked it in my google bookmarks to come back then. Hiya, I am really glad I’ve found this information. Today bloggers publish just about gossip and net stuff and this is really annoying. A good website with interesting content, this is what I need. Thank you for making this web-site, and I will be visiting again. Do you do newsletters by email? Hiya, I am really glad I’ve found this info. Today bloggers publish only about gossip and internet stuff and this is really annoying. A good web site with interesting content, that is what I need. Thank you for making this web site, and I will be visiting again. Do you do newsletters by email? Hey there. I found your site by the use of Google even as searching for a similar subject, your site came up. It seems great. I’ve bookmarked it in my google bookmarks to visit then. Hi there. I discovered your website by the use of Google whilst searching for a related matter, your web site came up. It looks great. I’ve bookmarked it in my google bookmarks to visit then. Hello there. I discovered your blog by way of Google whilst looking for a similar topic, your web site came up. It appears to be great. I have bookmarked it in my google bookmarks to visit then. Hey there. I discovered your website via Google even as searching for a comparable matter, your web site came up. It appears good. I’ve bookmarked it in my google bookmarks to come back then. Hey there. I found your blog by way of Google whilst looking for a related matter, your website came up. It appears to be good. I have bookmarked it in my google bookmarks to visit then. Hiya, I’m really glad I have found this information. Today bloggers publish just about gossip and internet stuff and this is actually irritating. A good web site with exciting content, that is what I need. Thanks for making this site, and I’ll be visiting again. Do you do newsletters by email? Hiya, I’m really glad I’ve found this information. Today bloggers publish just about gossip and net stuff and this is actually annoying. A good web site with interesting content, this is what I need. Thank you for making this web-site, and I’ll be visiting again. Do you do newsletters by email? Hiya, I am really glad I’ve found this info. Today bloggers publish only about gossip and web stuff and this is actually irritating. A good website with interesting content, that’s what I need. Thank you for making this website, and I will be visiting again. Do you do newsletters by email? Hi there. I found your site by means of Google even as searching for a similar matter, your site got here up. It seems good. I’ve bookmarked it in my google bookmarks to come back then. Hey there. I found your site by way of Google at the same time as searching for a similar subject, your web site came up. It appears great. I have bookmarked it in my google bookmarks to come back then. Hiya, I am really glad I have found this information. Nowadays bloggers publish only about gossip and web stuff and this is actually irritating. A good website with interesting content, that is what I need. Thanks for making this site, and I will be visiting again. Do you do newsletters by email? Hiya, I’m really glad I have found this information. Today bloggers publish only about gossip and web stuff and this is really annoying. A good web site with interesting content, this is what I need. Thank you for making this web site, and I’ll be visiting again. Do you do newsletters by email? Hi there. I discovered your web site by means of Google whilst looking for a similar matter, your site got here up. It seems great. I’ve bookmarked it in my google bookmarks to come back then. Hey there. I discovered your blog by the use of Google even as searching for a comparable subject, your website got here up. It appears to be great. I’ve bookmarked it in my google bookmarks to come back then. Hiya, I am really glad I have found this info. Nowadays bloggers publish only about gossip and web stuff and this is actually frustrating. A good blog with interesting content, that is what I need. Thank you for making this web site, and I will be visiting again. Do you do newsletters by email? Hiya, I’m really glad I’ve found this info. Today bloggers publish just about gossip and net stuff and this is really frustrating. A good web site with interesting content, that is what I need. Thanks for making this site, and I will be visiting again. Do you do newsletters by email? Hiya, I am really glad I have found this information. Today bloggers publish just about gossip and internet stuff and this is really annoying. A good web site with exciting content, this is what I need. Thanks for making this website, and I’ll be visiting again. Do you do newsletters by email? Hello there. I found your website via Google while searching for a comparable matter, your web site came up. It appears great. I have bookmarked it in my google bookmarks to visit then. Hiya, I’m really glad I have found this info. Today bloggers publish only about gossip and net stuff and this is really annoying. A good blog with exciting content, this is what I need. Thank you for making this website, and I’ll be visiting again. Do you do newsletters by email? Hey there. I discovered your website by means of Google even as looking for a similar subject, your website got here up. It looks good. I’ve bookmarked it in my google bookmarks to come back then. Hello there. I discovered your web site by means of Google even as looking for a similar topic, your web site came up. It appears good. I have bookmarked it in my google bookmarks to visit then. Hey there. I found your web site by means of Google while searching for a similar topic, your web site got here up. It looks good. I’ve bookmarked it in my google bookmarks to come back then. Hello there. I discovered your blog by way of Google even as looking for a related matter, your site came up. It looks good. I’ve bookmarked it in my google bookmarks to visit then. Hi there. I found your website by way of Google whilst looking for a comparable topic, your website got here up. It seems to be good. I have bookmarked it in my google bookmarks to visit then. Hey there. I found your blog via Google whilst looking for a related topic, your site got here up. It seems good. I’ve bookmarked it in my google bookmarks to come back then. Hey there. I found your web site by means of Google even as looking for a related topic, your website came up. It seems great. I’ve bookmarked it in my google bookmarks to come back then. Hiya, I’m really glad I’ve found this info. Nowadays bloggers publish just about gossip and web stuff and this is actually frustrating. A good web site with interesting content, this is what I need. Thanks for making this site, and I’ll be visiting again. Do you do newsletters by email? Hey there. I discovered your web site by the use of Google whilst searching for a related subject, your site got here up. It seems good. I’ve bookmarked it in my google bookmarks to come back then. Hi there. I discovered your website by the use of Google at the same time as searching for a related subject, your site came up. It seems great. I have bookmarked it in my google bookmarks to come back then. Hiya, I’m really glad I have found this info. Nowadays bloggers publish only about gossip and internet stuff and this is actually irritating. A good site with interesting content, that’s what I need. Thanks for making this site, and I will be visiting again. Do you do newsletters by email? Hiya, I’m really glad I’ve found this info. Today bloggers publish only about gossip and web stuff and this is actually irritating. A good site with exciting content, that’s what I need. Thank you for making this web-site, and I will be visiting again. Do you do newsletters by email? Hiya, I am really glad I have found this information. Nowadays bloggers publish only about gossip and internet stuff and this is really annoying. A good web site with interesting content, this is what I need. Thank you for making this web-site, and I’ll be visiting again. Do you do newsletters by email? Hello there. I found your site by the use of Google while searching for a comparable topic, your web site got here up. It looks good. I have bookmarked it in my google bookmarks to visit then. Hiya, I am really glad I have found this information. Today bloggers publish just about gossip and net stuff and this is really irritating. A good site with exciting content, that is what I need. Thanks for making this web site, and I will be visiting again. Do you do newsletters by email? Hiya, I’m really glad I have found this information. Today bloggers publish just about gossip and net stuff and this is actually annoying. A good site with exciting content, that is what I need. Thanks for making this website, and I will be visiting again. Do you do newsletters by email? Hiya, I am really glad I’ve found this information. Nowadays bloggers publish only about gossip and internet stuff and this is really annoying. A good blog with interesting content, that’s what I need. Thanks for making this web site, and I’ll be visiting again. Do you do newsletters by email? Hiya, I am really glad I’ve found this info. Nowadays bloggers publish only about gossip and web stuff and this is really irritating. A good site with exciting content, this is what I need. Thanks for making this website, and I’ll be visiting again. Do you do newsletters by email? Hello there. I discovered your web site via Google whilst looking for a similar matter, your site came up. It seems great. I have bookmarked it in my google bookmarks to visit then. Hi there. I discovered your site by the use of Google whilst searching for a related topic, your website came up. It appears to be good. I’ve bookmarked it in my google bookmarks to come back then. Hiya, I am really glad I’ve found this info. Nowadays bloggers publish just about gossip and internet stuff and this is actually frustrating. A good blog with exciting content, this is what I need. Thanks for making this web-site, and I’ll be visiting again. Do you do newsletters by email? Hello there. I discovered your site by the use of Google whilst searching for a comparable topic, your website came up. It appears good. I have bookmarked it in my google bookmarks to visit then. Hey there. I discovered your web site via Google while looking for a related matter, your web site came up. It appears to be great. I have bookmarked it in my google bookmarks to visit then. Hi there. I discovered your web site by way of Google even as looking for a comparable topic, your web site came up. It appears to be good. I’ve bookmarked it in my google bookmarks to come back then. Hiya, I’m really glad I’ve found this information. Today bloggers publish just about gossip and net stuff and this is really annoying. A good web site with exciting content, this is what I need. Thank you for making this website, and I’ll be visiting again. Do you do newsletters by email? Hiya, I am really glad I’ve found this info. Nowadays bloggers publish only about gossip and net stuff and this is actually frustrating. A good blog with interesting content, that’s what I need. Thanks for making this website, and I’ll be visiting again. Do you do newsletters by email? Hi there. I discovered your website by way of Google whilst searching for a related topic, your web site got here up. It seems great. I’ve bookmarked it in my google bookmarks to come back then. Hiya, I am really glad I have found this info. Nowadays bloggers publish just about gossip and web stuff and this is actually annoying. A good web site with interesting content, that’s what I need. Thank you for making this web site, and I’ll be visiting again. Do you do newsletters by email? Hiya, I am really glad I’ve found this information. Nowadays bloggers publish only about gossip and internet stuff and this is really frustrating. A good web site with exciting content, that is what I need. Thanks for making this web-site, and I’ll be visiting again. Do you do newsletters by email? Hi there. I found your blog by the use of Google at the same time as looking for a comparable topic, your site got here up. It appears great. I’ve bookmarked it in my google bookmarks to come back then. Hello there. I discovered your site via Google at the same time as looking for a comparable topic, your web site got here up. It appears to be great. I have bookmarked it in my google bookmarks to visit then. Hi there. I discovered your blog by the use of Google whilst searching for a related subject, your web site got here up. It appears good. I have bookmarked it in my google bookmarks to come back then. Hiya, I am really glad I have found this information. Today bloggers publish just about gossip and web stuff and this is actually frustrating. A good blog with exciting content, that’s what I need. Thank you for making this web-site, and I will be visiting again. Do you do newsletters by email? Hello there. I discovered your web site by way of Google at the same time as searching for a comparable matter, your website came up. It appears to be good. I have bookmarked it in my google bookmarks to visit then. Hey there. I discovered your web site by way of Google at the same time as looking for a comparable matter, your website got here up. It appears to be great. I’ve bookmarked it in my google bookmarks to visit then. I have been exploring for a little for any high quality articles or weblog posts on this kind of area . Exploring in Yahoo I eventually stumbled upon this site. Studying this info So i¡¦m glad to convey that I have a very just right uncanny feeling I found out exactly what I needed. I most definitely will make certain to don¡¦t overlook this site and provides it a glance on a constant basis. Hi there. I discovered your blog by the use of Google while looking for a similar matter, your website got here up. It appears to be good. I have bookmarked it in my google bookmarks to visit then. Hey there. I found your website via Google at the same time as searching for a similar matter, your web site came up. It appears to be great. I have bookmarked it in my google bookmarks to visit then. Hi there. I discovered your website by way of Google whilst searching for a comparable subject, your site got here up. It seems to be good. I’ve bookmarked it in my google bookmarks to visit then. Hiya, I’m really glad I’ve found this information. Today bloggers publish only about gossip and web stuff and this is actually annoying. A good site with exciting content, that’s what I need. Thank you for making this site, and I’ll be visiting again. Do you do newsletters by email? Hiya, I’m really glad I have found this info. Nowadays bloggers publish just about gossip and web stuff and this is really irritating. A good web site with interesting content, that’s what I need. Thanks for making this web-site, and I will be visiting again. Do you do newsletters by email? Hello there. I discovered your website by the use of Google even as looking for a similar topic, your web site got here up. It appears to be good. I’ve bookmarked it in my google bookmarks to visit then. Hiya, I am really glad I have found this information. Today bloggers publish just about gossip and net stuff and this is actually irritating. A good website with interesting content, that is what I need. Thanks for making this web-site, and I’ll be visiting again. Do you do newsletters by email? Hiya, I’m really glad I have found this information. Today bloggers publish only about gossip and web stuff and this is actually annoying. A good website with exciting content, that’s what I need. Thanks for making this website, and I will be visiting again. Do you do newsletters by email? Hey there. I discovered your website via Google while searching for a related matter, your website came up. It seems good. I’ve bookmarked it in my google bookmarks to come back then. Hiya, I am really glad I have found this information. Today bloggers publish just about gossip and web stuff and this is really frustrating. A good blog with interesting content, this is what I need. Thank you for making this web-site, and I’ll be visiting again. Do you do newsletters by email? Hi there. I found your website by the use of Google while searching for a comparable subject, your site came up. It seems great. I have bookmarked it in my google bookmarks to visit then. Hiya, I am really glad I have found this information. Nowadays bloggers publish just about gossip and internet stuff and this is really irritating. A good web site with exciting content, this is what I need. Thanks for making this web-site, and I’ll be visiting again. Do you do newsletters by email? Hiya, I’m really glad I have found this info. Nowadays bloggers publish only about gossip and net stuff and this is really irritating. A good website with exciting content, that’s what I need. Thanks for making this site, and I’ll be visiting again. Do you do newsletters by email? Hi there. I found your website by means of Google even as searching for a related matter, your web site got here up. It looks great. I have bookmarked it in my google bookmarks to visit then. Hey there. I discovered your site via Google whilst searching for a related subject, your website came up. It appears good. I have bookmarked it in my google bookmarks to visit then. Hiya, I’m really glad I’ve found this information. Nowadays bloggers publish only about gossip and web stuff and this is really annoying. A good site with interesting content, that’s what I need. Thank you for making this site, and I’ll be visiting again. Do you do newsletters by email? Hi there. I found your web site via Google even as searching for a related matter, your website got here up. It looks great. I have bookmarked it in my google bookmarks to visit then. Hi there. I discovered your blog by the use of Google while searching for a comparable matter, your web site got here up. It looks good. I have bookmarked it in my google bookmarks to visit then. Hey there. I discovered your website by way of Google at the same time as searching for a similar topic, your web site got here up. It looks good. I have bookmarked it in my google bookmarks to visit then.